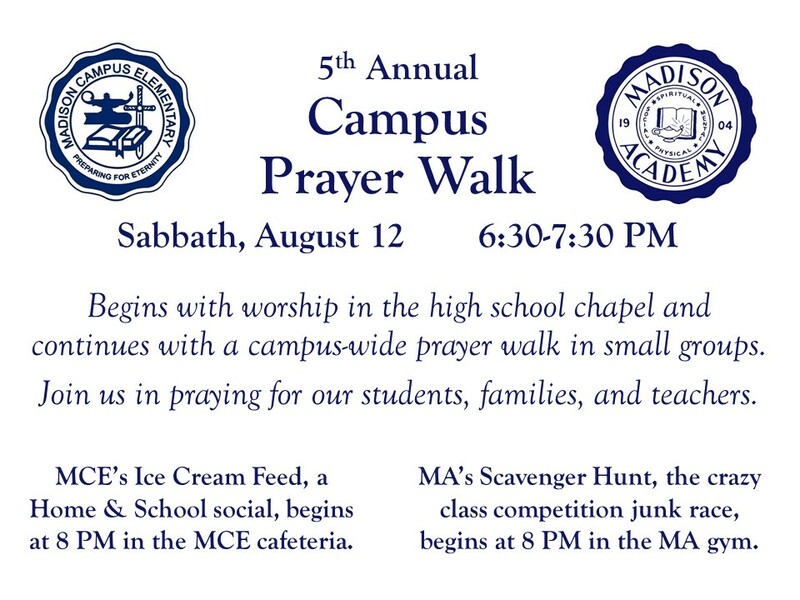 You are invited to join us for a Prayer Tour of Madison Academy and Madison Campus Elementary on Sabbath, August 12 from 6:30 – 8:00 PM. As we prepare for the coming school year, we want to dedicate our campus. We will begin with worship and then walk the buildings and grounds while praying for our students, families, and teachers. Madison Academy is still accepting applications. For more information, visit us online at madisonacademy.com or call us at 615.865.4055. Freshmen orientation is Tuesday, August 8 from 8:00 AM – 1:30 PM, and the first day of school is Wednesday, August 9.